You are here: Home » GENRE » Scifi » Space Patrol: The Complete Series (1962-63) (Blu-ray TV series review). 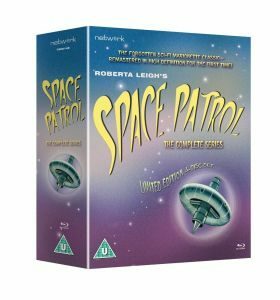 Space Patrol: The Complete Series (1962-63) (Blu-ray TV series review). It was a big surprise spotting I nearly missed ‘Space Patrol’ was being released earlier in the year on blu-ray. Back in the 1960s, it was the only other space age puppet show other than the Andersons’ Century 21 company, although it was a breakaway from that led by Arthur Provis when creator Roberta Leigh wanted to do an SF-based series. Back in the late 1950s, there was still a belief that there was life on the other planets, so hardly surprising that this came out in the fiction of the time period. ‘Space Patrol’ kept that alive until space technology got probes to the various planets. It does miss out on Yasanne Churchman stepping in to play Marla for about eleven episodes towards the end of the series. If her name sounds familiar, think of the ‘Doctor Who’ story ‘The Monster Of Peladon’ where she voiced the Alpha Centauri ambassador. The Gabberdictum bird was another of Libby Morris’ talented interpretations. Space Patrol’s main Earth scientist is Professor Haggerty (again, Ronnie Stevens) who has a daughter, Cassiopeia, commonly called Cassie (again, Libby Morris). Haggerty isn’t the only major scientist and others from other worlds pop up from time to time. Think how many times of series where there is only one major scientist so back in 1961 this was actually ground-breaking. I defy anyone not to be to mimic some of the voices after watching the series, especially if you like Martian sausages. There is also a semblance of order with the stories as they progressed through the season so it is never wise to jumble them up. Don’t rely on IMdB for its accuracy here as its way off. As you watch the series, you do get a strong sense of continuity. Much of the space travel in the Galasphere is done in freezer hibernation. To get to Jupiter takes 42 days and over half a year to get to Pluto. Although it’s not stated how old everyone is on Earth, it does become apparent as young Cassie grows over the series. One thing that blu-ray has made obvious to me is with ‘The Wandering Asteroid’, it is more obvious that the Galasphere crew have their suits updated and have a more glittery shine to them. It’s also the time when Ysanne Churchman joins the voice cast for eleven of the last twelve episodes. The first episode has this crew using a back-up Galasphere and the footage of take-off protocols was frequently re-used for 25 episodes. Alas, no one thought the series would be forever repeated and no one thought to re-edit the serial number of the spacecraft or even notice. Well, we didn’t in those days. It just saved time reusing the same footage in different ways. ‘The Dark Planet’ episode also gives an indication why the planet Uranus is now pronounced differently these days. Oh for more innocent times. Oh, because there was already a 1950s ‘Space Patrol’ series in America, the series was renamed ‘Planet Patrol’ when shown in the USA. Having watched the series a number of times over the years, this time I was focusing on things that were a first done through a SF TV series here and bear in mind, to be released in 1963, Roberta Leigh had to be working on the scripts at least two years earlier. The Galasphere never looked like a rocket, although they were also used in the series but mostly only for cargo. The necessary flight checks before taking off might seem repetitive but you could see the crew took these things seriously. In the later episodes, it is explained that the Galasphere hull is made from plutonite, a rare mineral from Pluto and that is why there is only a small fleet of them. Yabba rays are mentioned a lot but only shown in one episode as being a form of x-ray to see beneath Venus’ cloud layer. They even have a silent robot on-board to run certain aspects like landing and while in the freezer to run things on automatic. The first use of hibernation for lengthy space flight and you do have to wonder if Stanley Kubrick watched the series, especially as he watched the Andersons’ shows. The Galaspheres are driven by levers which removes it from the ‘Buck Rogers’ way of doing things. Probably the biggest error made is confusing different stars with galaxies but that happened a lot in that time period. The first to show ecological disasters with lack of water on Mars, lack of food and so forth with their own novel solutions. Not that they were necessarily true to life like having enough frozen water on Pluto to export it to Mars but there was some thinking here. The first act of terrorism, at least in a puppet show, with ‘Mystery On The Moon’. Others were to follow. Oddly, ‘terrorism’ wasn’t a widely used word back then but the actions are the same when you threaten violence if you didn’t do as you were told. The first truly alien aliens. All right they are puppets but they didn’t all stay humanoid let alone have four limbs. Some were plants with high voices. The first alien language translator which can be programmed to do their job. There was even teleportation but this was from an alien from Alpha Centauri. There’s even an original ‘Star Trek’ connection as its episode ‘Wink Of An Eye’ is almost a copy of ‘Space Patrol’ where Professor Haggerty creates a time watch which can be used to accelerate an individual so a minute equals an hour. It’s probably their biggest deux ex machine but was only used in two episodes. Don’t expect me to praise everything. ‘The Water Bomb’ episode has some iffy chemistry if only because the Earth is supposed to have clouds of hydrogen in the upper atmosphere. As to hydrogen bombs, they were very much classified in those days but you wouldn’t do it her way neither. It isn’t quantity but isotope that’s important. Although there are no extras with this blu-ray, I do remember one with the DVD version with the conversation about the problems of getting puppets to walk and their exploration of mechanisms to get it right. With this watching, although running is difficult because the arms don’t really move, the walking is actually a lot better than the Anderson product for the human puppets and not relying on moving platforms. It’s more a problem of co-ordinating arms to do something but the walking wasn’t too bad. In fact, they are even more creative. They also have a Martian spider walking rather convincingly with 8 legs. This is an even cleaner print than the DVD version. ‘Space Patrol’ is addictive watching even after all these years. Watching the drama elements with adult eyes and its less about heroism but problem-solving, which is the essence of Science Fiction. Writer Roberta Leigh obviously put a lot of thought into creating her reality, extrapolating on what little we knew or thought at the time, making it a rather unique period piece. Expect to be surprised. Have I praised it enough? « Godblind: Tome 1, by Anna Stephens (book review).